There are a lot of different ways to make polenta. I’ve discovered that the longer you cook it, the creamier and tastier it gets. However, I don’t have time for that during the week-my favorite polenta recipe takes almost 2 hours! But, the recipe I use here gives a nice polenta that works with these mushrooms and I didn’t get any complaints. This is still one of the longer meals I cooked this week-it took me 1 3/4 hours from start to eating, but that included making the side dishes as well. It was worth it-even my 14 year old stepson ate it without complaint! Prepare the mushrooms first by heating half the oil and butter in a large saute pan over medium-high heat. When butter foams, add 1/2 the mushrooms-the reason for frying in half batches is that you want a nice, brown finish on your mushrooms and if you crowd the pan, you’ll end up steaming them with too much moisture instead of frying them in the butter/oil combo. This I learned from Julia Child, one of my culinary heroes. So, once you have your mushrooms in the pan, let them cook without stirring too much, just give the pan a shake here and there. They’ll absorb all the oil/butter at first, but then release it as they cook. Don’t be afraid of high heat here, it’s a technique that will make for a delicious finished product. Once you’ve got a nice, brown finish on your mushrooms, remove to a plate and repeat with other half of mushrooms and butter/oil. Then, off heat, return all the mushrooms to pan and stir in shallots, tarragon, thyme, truffle oil, the salt and freshly ground pepper to taste. Set aside and make polenta. Bring stock and water to a boil in a saucepan. Slowly stir in polenta, then reduce heat and simmer, stirring frequently with a wooden spoon. Polenta will be done when it leaves the sides of the pan, but is still runny. Give it a taste when all the liquid first absorbs and see what you think. If it needs to cook more, add 1/2 cup more water and keep stirring. The polenta should be done in 30-40 minutes. When polenta is done, stir in the Parmesan, butter, rosemary and fine sea salt and pepper to taste. Preheat broiler. Spread polenta over a heatproof dish (I used my pizza stone for this) and top with the Taleggio. Place under broiler until the cheese bubbles. 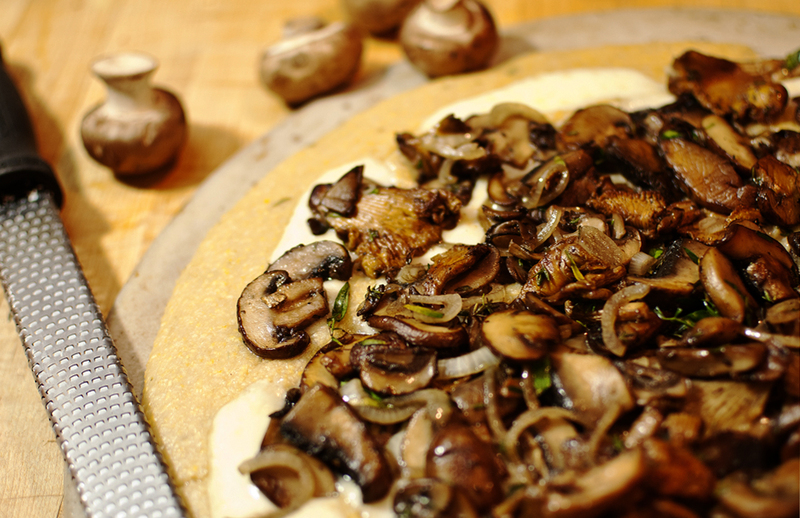 Take out and top with the mushrooms and their juices, return to broiler for a minute or two to warm the mushrooms. Serve hot. I served this with a salad with pomegranate, pears and chevre.